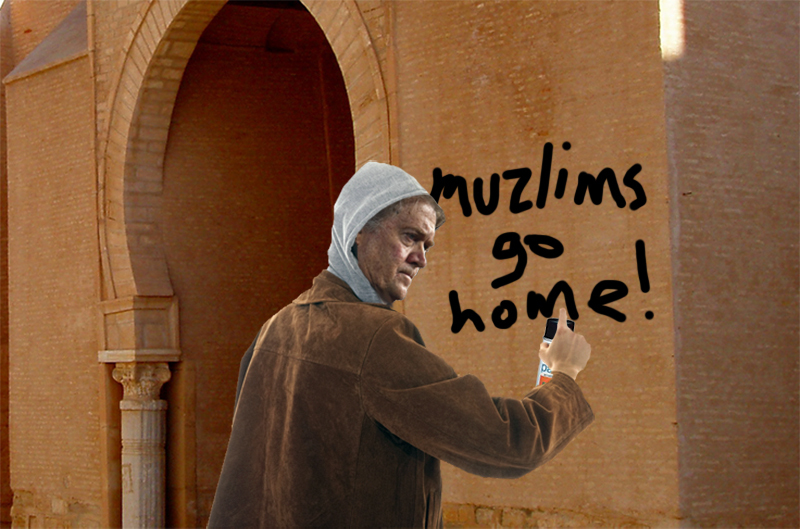 Before leaving Saudi Arabia, Steve Bannon asked his convoy to pull over at a mosque so he could spray paint 'muzlims go home!' along the front. Riyadh, Saudi Arabia – On Sunday evening as the Trump delegation left Saudi Arabia for Israel, White House Chief Strategist Steve Bannon reportedly requested the convoy to abruptly pull over at a nearby mosque. Much to the confusion of the entire staff, a frustrated Bannon then pulled out a can of spray paint from his attaché, draped him self in a beige hoody and quickly made his way toward the mosque. The former Breitbart executive painted the words: “Muzlims go home!” before scurrying back to his limo, and prompting the driver to “go, go, GO!” as banjo getaway music blared through the speakers. As the limo screeched away from the mob of angry locals stampeding toward them, a shocked Rex Tillerson asked Bannon about what he just witnessed. The Press Secretary then pretended to be a White House statue to avoid any further questions. As the President’s team arrives in Tel Aviv, a spokesperson assures Israel they will keep Bannon clear of any Synagogues.